And the book truly delivers on this promise. What we liked best is that Indians are so often accused that we can’t take a joke on ourselves. This book flagrantly makes fun of everything we know to be excessive including the near worship like love that South Indians have for their film stars to the recent lot of IIT/IIM turned writers in Indian literature. The book starts with a Telugu family in Thokkapalem village of West Godavari district waiting outside a film theatre to watch the first-day-first-show of “Giga Star” (“Mega” is so twentieth century no! 🙂 ) PKR. There is a life-size cut-out of PKR outside the theatre which has just been anointed with milk-abhishekam…. But, the book promises melodrama – so the villain enters – Pedda Rayudu sweeps in with his thugs and takes over the theatre. No first-day-first-show for the Sonti family. But, Mrs. Sonti Kantham is a force to reckon with. She nudges her husband on to fight Pedda Rayudu. Unfortunately, he is not a movie star, so he slips in a puddle and falls and the cut out of PKR falls on top of him resulting in his death. Of course, Mrs Sonti Kantham swears on revenge by little Seenu when he grows up. Meanwhile, she is taken to hospital and gives birth to twins – a lame son called Sripadam and a blind daughter called Sunethra. Seenu grows up to become agent SS 555 working for Indian Secret Service who are now being funded by Pepsico due to being in a cash crunch. The new super villain called Chairman has come on the world front and is threatening to put a chemical in the water supply of the world that will make ‘Motion Impossible’, unless he is given a Bharat Ratna, a Nobel prize and an Oscar. SS 555 is charged with stopping this atrocity from happening. Thanks to Pepsico, he is given a super-lovely, ‘drop-dead gorgeous‘ assistant Rim Jhim Nair, who has a diploma in fashion design, black belt in Bharatnatyam, does the Rubik’s cube in under a minute and was a backup singer for Mohanlal’s music troupe (No kidding!!). She also happens to be a Mallu, allowing a few jokes on the side. 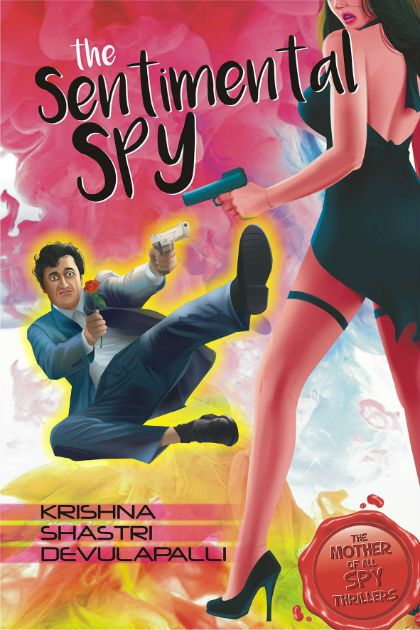 But, every secret agent also needs a sidekick, so SS 555 gets Jignesh Prem Babu, who is an aspiring English writer. Throw in a not-so-holy godman called Adman Swami who is running from Police and the crew is complete. Since it is a family based entertainer, SS 555 drives off in search of glory in a minivan driven by his blind sister and containing his entire family, Jignesh, Rim Jhim, Adman and himself. Hardly a secret mission !!!! Never mind, as it is a story, and all stories must have an end, they all find ‘Chairman‘, Seenu defeats him in a final disco-out and the saga ends with multi-marriages, but does it? Watch out for the sequel…..
Who sent you? Tell me! Is it the ISI? Or ICICI? How many times do I have to tell them I don’t want a home loan? The Indian writer is the most shameless, diabolical, megalomaniac creature in the world – and that includes the progeny of politicians, NRI Bharatnatyam dancers and bachelor male monkeys in heat. The Indian writer is a unique beast that feels no pain, guilt or after-effects, no matter what. You can do anything to him and he will plug his book, unaffected. That is his one-point agenda. And I’v got a specimen for you that has traversed the badlands of the Delhi publishing scene like it was a picnic. SS buckled – in the tradition of generations of Telugu men of the priestly clad from west Godavari district before him when having to choose between a mother and what was good, right, logical, fair and non-fatal. The book is exclusively available on Juggernaut website/app only. Purchase price of INR 30 makes it a “value for money” book.